At one point, the north/south corridor of Interstate 75 (I-75) in Florida’s Broward and Miami-Dade counties was a road with relatively light traffic allowing motorists to cruise along at highway speeds most of the time. This changed after Hurricane Andrew blew through in 1992. Andrew leveled thousands of homes and businesses, causing a mass migration to the newer, available homes along the I-75 corridor. With this shift, new traffic patterns developed along I-75 and other major roadways, creating significant areas of congestion in some cases. 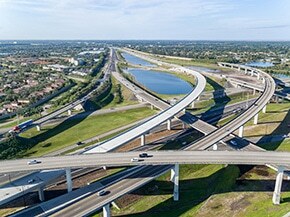 The Florida Department of Transportation (FDOT) responded to the challenges with plans to alleviate traffic congestion and improve connectivity. The plans included additional lanes and enhancements to existing roadways and reversible, dedicated open-road toll lanes. Early in 2014, construction began on the $485 million road project, which was scheduled in four segments. Having provided geotechnical and materials testing services for a number of South Florida projects, Terracon served as an instrumental part of the Segment E improvements. As with most area projects, the geotechnical design was complicated by existing marshy terrain and unknown subsurface conditions. Terracon’s subsurface exploration team worked quickly to collect all the necessary data from the field, enabling our geotechnical engineers to collaborate with the project’s lead designer, WSP USA, to understand the conditions. In order to test and confirm pile depths and capacities, Terracon’s pile-driving analyzer and operating engineers were deployed together during construction to work with the team. This data gathering phase was complicated by the need to keep traffic moving. Key challenges for the maintenance of traffic included reducing traffic shifts, limiting lane closures, and reducing weaving and merging. As the project progressed into construction, Terracon went on to perform all the contractor quality control (CQC) testing of the materials on behalf of Dragados USA, the design-build contractor. CQC services included laboratory testing of soils and concrete, and other key components including bridge inspection, to ensure contractor compliance with FDOT plans and specifications. In addition to working closely with WSP USA and DUSA, the Terracon team needed to coordinate with the construction engineering consultant firm (CEI), Target Engineering, and FDOT. Tasks included communication about data, scheduling, testing, and reporting results. A unique challenge for data reporting on this project was moving data entry from the Laboratory Information Management System to the Materials Acceptance Certification system at the midpoint of the project. Terracon provided reliable data using properly trained, certified, and experienced staff to confirm the integrity of the materials used met the project specifications. The Terracon team included technicians who had completed FDOT’s Construction Training Qualification Program (CTQP). They observed and tested more than 600,000 cubic yards of excavation and embankment material; 700,000 square yards of base material; more than 35,000 tons of asphalt materials; and more than 50,000 cubic yards of concrete. With the project nearing completion and soon to be fully open to traffic, South Florida residents and commuters will greatly benefit from these unique, reversible toll lanes. The project provided an opportunity for Terracon to further demonstrate our transportation support capabilities and capacity utilizing multiple team members from three of our nearby offices. As a go-to consultant for critical transportation projects like I-75, Segment E, Terracon is committed to the transportation industry and proud to help our design and construction clients solve challenging issues through creative solutions. 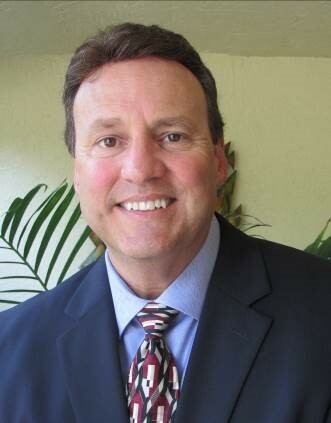 Rich Minichiello is a regional manager, in our Fort Lauderdale office. Rich leads a diversified practice including geotechnical, environmental engineering services, construction materials testing, laboratory services, and facilities engineering services for the transportation, education, commercial, water, Federal, state, and local market sectors.